The first official acquisition of 2018 is here. 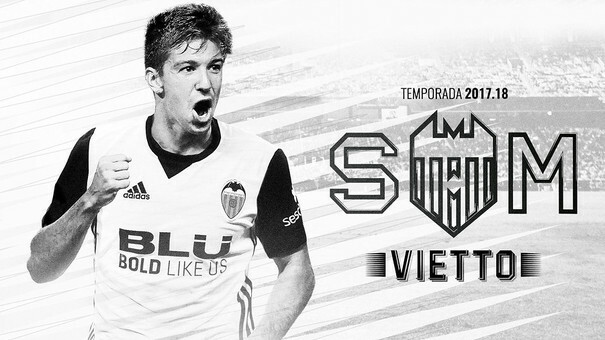 Vietto, who Valencia have been interested in for at least 4 years, finally joins, reuniting with Marcelino, with whom he enjoyed one of his most productive seasons at Villarreal. The deal is said to be for 2m on loan until the summer, with a non-compulsory buy option of between 13 and 14 million. Since leaving Villarreal for Atletico, Vietto hasn't yet fulfilled his early promise, finding opportunities limited in Madrid, being sent on loan to Sevilla and then returning this season, where the arrival of Costa would limit him further. His strengths include dribbling, passing and off the ball movement, all of which will be useful in a transition based counter attacking Valencia side. He could do well in link up play. He is also fine with both feet. Weaknesses would be that he isn't that great in the air and then there's the elephant in the room, he isn't that prolific a goalscorer. and there's a good possibility that we may see him feature this weekend, especially as Zaza is suspended. Sub would be my bet. I can see that some of our fans are already complaining about this one on social media. I don't see why. The club has been following him for some time, Marcelino knows him well and, another plus, he wants to come here, turning down a more or less done deal to go to Sporting Lisbon. Sandro could have been better but Everton's hardball tactics meant that Valencia had to look elsewhere. My response, aside from asking if people will ever stop moaning, even when the team is doing well, is to wait and see. Marcelino and Simeone, two of the best managers in La Liga, rate him highly and if Marcelino can get goals out of underperforming strikers like Rodrigo and Mina, he can do the same with Vietto. Ultimately I trust Marcelino's judgement, which has served us well this season. In brief snippets of other news, plazadeportiva report that Lazio are interested in buying Nani but want to pay less than the 10m buy option negotiated as part of his loan. Given his limited playing time there, it might simply be a case of Valencia accepting 7 or 8 million just to get him off the books. Transfermarkt recently updated the value of Valencia's team and it makes positive reading. The overall value of the squad jumps from 181 million to nearly 300 million, overtaking Sevilla and Villarreal. In terms of individual players not on loan, Soler (predictably) and Rodrigo make the biggest jumps, going from around 7.5m to 25m with most other players rising, for example Lato from 3m to 8m. Less positively, Guedes' value this season has gone from 17m to 40m, complicating our hope of buying him. The last piece of news is a bit like the dog in the night in the Sherlock Holmes story: the series of editorials which Meriton promised in November gloating about success explaining their position did not materialise, which for club harmony is a really good thing. The club is still in a good position to reach Champions league and that will matter more to fans than 300 editorials.